Russia and the U.S. will resume stalled talks on a replacement nuclear arms reduction treaty in early February, Russia's Foreign Minister Sergey Lavrov said Friday. Military officials are holding talks in Moscow to clarify differences over verification and missile defense, Lavrov said. "The remaining questions will be solved rather quickly," he told journalists. "The talks will resume in the very beginning of February. ", AP reported. U.S. officials said earlier they expected talks to resume Monday in Geneva. The chairman of the Joint Chiefs of Staff, Adm. Mike Mullen, and retired Gen. Jim Jones, President Barack Obama's national security adviser, were in Moscow this week to discuss treaty negotiations. A new agreement would succeed the 1991 Strategic Arms Reduction Treaty, or START, which expired Dec. 5. The two countries had hoped to reach a deal before the end of the year, but problems persisted. In late December, Moscow said it wanted Washington to share detailed data about the sea- and land-based systems the U.S. plans. The systems would replace the interceptor missiles and radar the U.S. had planned to base in Poland and the Czech republic. Russia treated the plans as a threat, and President Barack Obama scrapped them last year. 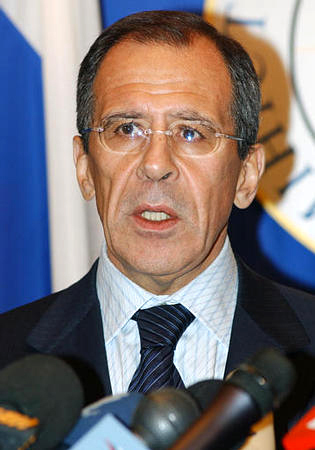 Lavrov called on Washington to change its approach. "What they have to give up is the logic of the old deal," he said. "The new accord is being concluded at a time when we can only deal with each other as equals." Obama and Russian President Dmitry Medvedev agreed in July to cut the number of nuclear warheads each country has to between 1,500 and 1,675 under a new treaty. Moscow and Washington both want to reach a new accord quickly to give credibility to their efforts to persuade Iran and North Korea to abandon their nuclear programs. Lavrov also said he didn't understand Polish plans to station a battery of U.S. Patriot missiles near the border with the Russian exclave of Kaliningrad. Lavrov was reacting to an announcement Wednesday by the Polish Defense Ministry saying a base with up to eight launch pads, manned by some 100 U.S. troops, will be installed in a town 37 miles (60 kilometers) from the Poland-Kaliningrad border. Poland said the missiles, to be installed in April, will be used to train the military. Lavrov said he couldn't comprehend the need "to create the impression as if Poland is bracing itself against Russia." Scrapped U.S. plans to position a missile defense system in Central Europe had angered Moscow, which accused Washington of undermining its national defense.